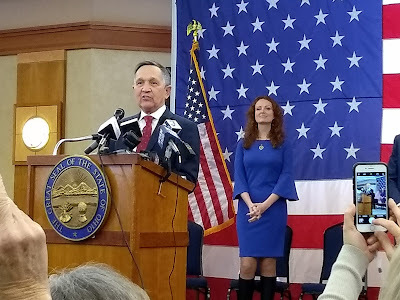 Dennis Kucinich, announcing his campaign for governor of Ohio. (Photo I took covering the announcement.) The woman in blue is his wife, Elizabeth, who's from London. With the recent military strike in Syria by the U.S. and its allies, it seems appropriate to say something here, given Robert Anton Wilson's long antiwar stance. I've long been opposed to American military involvement in Asia, like everyone in the U.S. antiwar movement. But it seems like the new strikes are particularly dangerous. How would a war with Russia be in anyone's interest? If I can try to find something positive in the current situation, I would like to point out that there are people who agree that President Trump's military action was illegal and unwise. They don't hold power, they go up against a bipartisan consensus, but they are there. Dennis Kucinich, my former Congressman, is now running for governor of Ohio. He issued a statement today. It begins, "President Trump acted without congressional authorization in ordering a military attack against Syria tonight. This is a clear violation of the United States Constitution, Article 1, Section 8 which makes it clear that only Congress has the power to declare war." He also said, "The President’s confrontation with the Russian military based in Syria endangers American troops stationed there. There is a danger of a much wider war with both Russia and Iran." U.S. Rep. Justin Amash of Michigan, a nominal Republican, really more of a libertarian, had a good statement on Twitter: "These offensive strikes against Syria are unconstitutional, illegal, and reckless. The next speaker of the House must reclaim congressional war powers as prescribed in Article I of the Constitution. @SpeakerRyan has completely abdicated one of his most important responsibilities." 4,320 retweets as of this morning, which means 4,319 that weren't me. I could also have quoted Glenn Greenwald and other folks, mostly libertarians and progressives. We need a viable antiwar movement in this country. "Anti-war" may need to be translated into "anti-Military-Industrial-Complex," or "anti-Corporatocracy." Or we could look at our culture's Love/Fear relationship with competition and our strain of "freedom loving" fear of Socialistic cooperation.